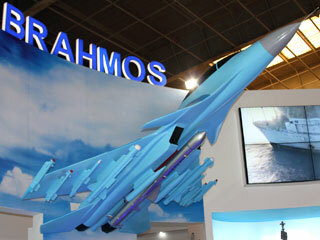 ZHUKOVSKY: The first launch of BRAHMOS supersonic cruise missile from a Sukhoi Su-30MKI fighter will be carried out in early 2016, head of Russian-Indian BrahMos Aerospace enterprise Sudhir Mishra told RIA Novosti Tuesday. Speaking at the International Aviation and Space Salon MAKS air show outside Moscow, Mishra told RIA Novosti that first flights with a launcher went well. "After this, a test launch of a mock missile will be carried out, and then final testing with a regular missile from a plane. We hope that this will take place in the beginning of 2016," Mishra said. The BrahMos chief executive said the supersonic missile's integration with the Su-30MKI multi-role fighter would supply India with a long-range weapon without endangering the aircraft. "After all, the Su-30 can fly with aerial refuelling a distance of about 3,500 kilometers [over 1,800 miles], and the BRAHMOS' long range allows it to be launched from a safe distance," Mishra stressed. The missile's flight range is 290 km. The estimated $425-million supersonic missiles capable of flying at supersonic speeds of up to Mach 3 (over 2,200 mph) are expected to be fitted in the Indian Navy's three Talwar-class frigates and three Delhi-class destroyers, all built in collaboration with Russia.